Economic reasoning often begins with a presumption that people act in a self-interested manner. And so there's been a string of small-scale research over over time about whether studying economics makes people more likely to act in a selfish manner. Adam Grant offers a nice short overview of this research (with links to underlying papers!) for Psychology Today last October, in "Does Studying Economics Breed Greed?" The especially tough question in this research is how to distinguish between several possibilities: 1) Maybe studying economics changes the extent to which people act selfishly; 2) Maybe studying economics makes people more willing to admit that they might act selfishly, or makes them act more selfishly in small-scale classroom game interactions, but doesn't actually change their real-world behavior; or 3) Maybe people who are more likely to act in their own self-interest, or more likely to admit that they act in their own self-interest, are drawn to economics in the first place. "In one experiment, Andy Molinsky, Joshua Margolis, and I recruited presidents, CEOs, partners, VPs, directors, and managers who supervised an average of 140 employees. We randomly assigned them to unscramble 30 sentences, with either neutral phrases like [green tree was a] or economic words like [continues economy growing our]. Then, the executives wrote letters conveying bad news to an employee who was transferred to an undesirable city and disciplining a highly competent employee for being late to meetings because she lacked a car. Independent coders rated their letters for compassion. Executives who unscrambled sentences with economic words expressed significantly less compassion. There were two factors at play: empathy and unprofessionalism. After thinking about economics, executives felt less empathy—and even when they did empathize, they worried that expressing concern and offering help would be inappropriate." Of course, a skeptic might object that even if the "priming" with economics terms changes the amount of compassion expressed in a "bad news" letter, the executives would still deliver the bad news when they felt it was necessary. In a 2011 study published in Academy of Management Learning & Education, Long Wang, Deepak Malhotra, and J. Keith Murnighan carry out various experiments on the topic of "Economics Education and Greed." (10 (4): 643–660). For example, several of their experiments are online surveys in which people in various ways revealed their attitudes about greed. Those who majored in economics, or who read a snippet of economics before answering, were less likely to express attitudes that strongly condemned greed. Of course, a skeptic might point out that such surveys show what people say, but not necessarily what they feel or how they act. 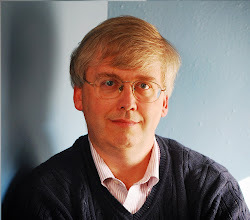 and Dennis T. Regan ask "Does Studying Economics Inhibit Cooperation?" They present a variety of evidence that raises cause for concern. For exmaple, they present data that economists in academia are more likely to give zero to charity than others. They report the results of surveys in which students are asked what would happen if they were working for a company that paid for nine computers, but accidentally received ten. Do they expect the error would be reported back to the seller, and would they personally report the error? Those who have taken an economics class are less likely to say that the error would be reported, or that they would report it, than students in an astronomy class. Again, a skeptic might point out that even if economists are less likely to give to charity, this pattern may have been established well before they entered economics. And maybe the economics class is just causing students to be more realistic about whether errors would be reported and more honest in reporting what they would really do, compared with those in other classes. In a study in the Winter 1996 issue of JEP that Grant doesn't mention in his brief Psychology Today overview, Anthony M. Yezer, Robert S. Goldfarb, and Paul J. Poppen discussed ""Does Studying Economics Discourage Cooperation? Watch What We Do, Not What We Say or How We Play," They carried out a "dropped letter" experiment, in which a letter was left behind in various classrooms around the George Washington University campus, some economics classrooms and some not. The letter was addressed and stamped, but unsealed and with no return address. Inside there was $10 in cash, and a brief note saying that the money was being sent to repay a loan. In their experiment, over half of the letters that were dropped in economics classrooms were mailed in with the cash, compared with less than a third of the letters dropped in noneconomics classrooms. They also argue that substantial parts of the economics curriculum are about mutual benefits from trade, both between individuals and across national borders, and in that sense economics may encourage students to see economic interactions as friendly to decentralized cooperation, rather than as just an arena for clashes of unfettered selfishness. In a similar spirit, I sometimes argue that many students enter an economics class seeing the world and the economy as fundamentally a zero-sum game, where anyone who benefits must do so at the expense of someone else. Learning about how division of labor and voluntary exchange at least has the possibility of being a positive-sum win-win game makes them more likely to consider the possibility of benefiting both themselves and others. Maybe there are some unreconstructed business schools which do teach that "greed is good." But all the economics curricula with which I'm familiar is painstaking about explaining the situations and conditions in which the interactions of self-interested parties is likely to lead to positive outcomes like free choice and efficiency, and also the situations and conditions in which it can lead to pollution, unemployment, inequality, and poverty. My own sense is everyone plays many roles and wears many hats. A surgeon who cuts into people all day would never dream of getting into a knife fight on the way home. An athlete who competes ferociously all week goes to church and volunteers to help handicapped children during off hours. A parent fights grimly over the appropriate annual marketing plan, and then goes home and hugs their children and takes dinner over to the neighbors who just had a baby. Some economic behaviors certainly shouldn't be generalized to the rest of life, and it's possible to set up situations with questionnaires and little classroom experiments where the boundaries can become blurred. But there's not much reason to believe that Darwinian biologists practice survival of the fittest in their spare time, nor that sociologists give up on personal responsibility because everything is society's fault, nor that lawyers go home and argue over fine print with their families. It's worth remembering that Adam Smith, the intellectual godfather of economics, reflected on selfishness and economics at the start of his first great work, The Moral Sentiments, published in 1759. The opening words of the book are: "How selfish soever man may be supposed, there are evidently some principles in his nature, which interest him in the fortune of others, and render their happiness necessary to him, though he derives nothing from it except the pleasure of seeing it." And later in the same chapter: "And hence it is, that to feel much for others and little for ourselves, that to restrain our selfish, and to indulge our benevolent affections, constitutes the perfection of human nature; and can alone produce among mankind that harmony of sentiments and passions in which consists their whole grace and propriety." Smith saw no contradiction in thinking about people as containing both selfishness and "benevolent affections," and most people, even economists, seek a comfortable balance between the two depending on the situation and context. In the question-and-answer period after I give talks about the U.S. economy, someone always seems to ask about whether the U.S. dollar will remain the world's reserve currency. But at least so far, it's holding steady. Eswar Prasad reviews the arguments in "The Dollar Reigns Supreme, by Default,"
which appears in the March 2014 issue of Finance & Development. One way to look at the importance of the U.S. dollar is in terms of what currency governments and investors around the world choose hold as their reserves. 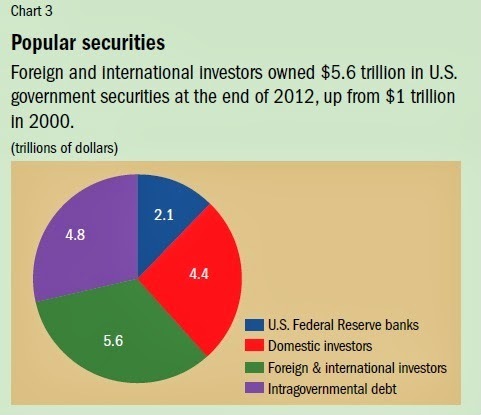 In the aftermath of the 1998 financial and economic crash in east Asia, lots of countries started ramping up their U.S. dollar international reserves. In the aftermath of the Great Recession, a number of countries spent down their dollar reserves to some some extent--and now want to rebuild. For example, here's a figure from Prasad on the form in which governments hold foreign exchange reserves. 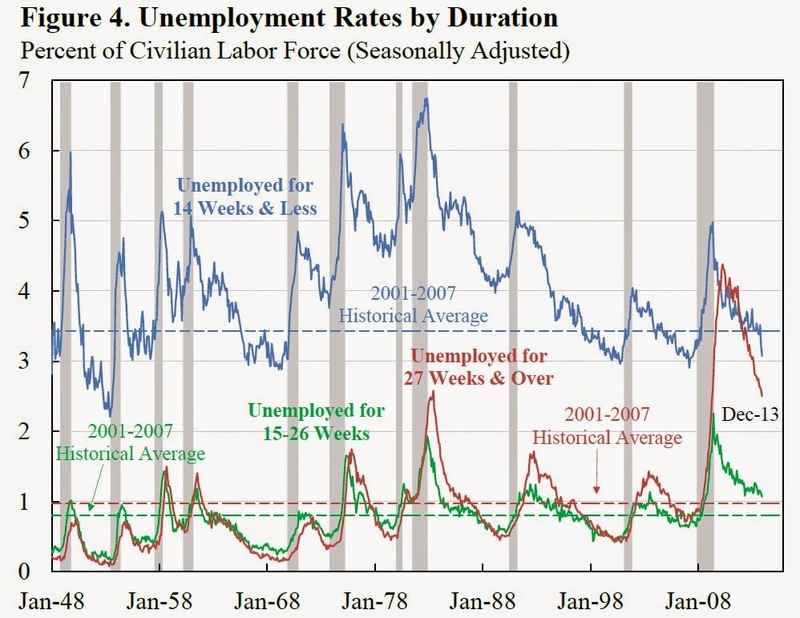 Notice that there's no drop-off in the years after the recession. during the worst of the crisis." 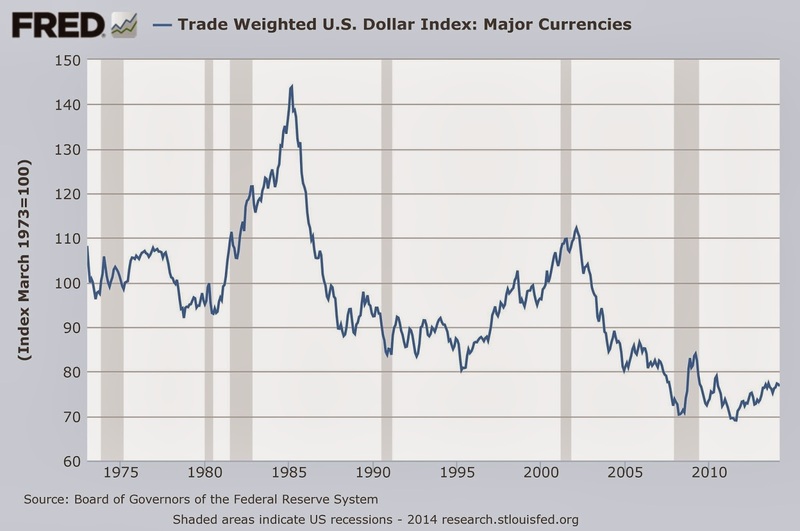 The U.S. dollar is also by far the dominant currency in world economic transactions. It is often how global prices are denominated. When bills are paid between counties, or investments are made between countries, and there is a need to carry out an exchange rate conversion, the U.S. dollar is often involved even when the transaction has nothing to do with the U.S. economy, because other currencies are converted into dollars in the inner processes of the exchange rate markets. The U.S. dollar is used in 87% of all foreign exchange transactions, in foreign exchange markets that are now trading over $5 trillion per day. 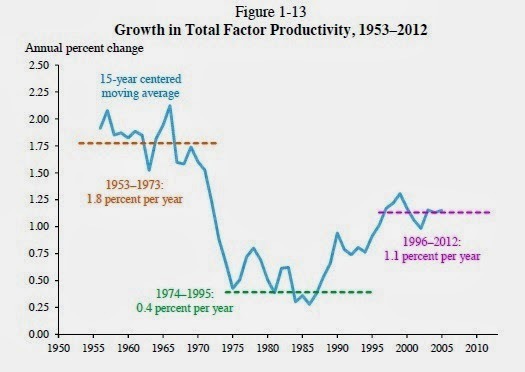 productivity growth than the United States, so once global financial markets settle down, the dollar is likely to return to the gradual depreciation it has experienced since the early 2000s. In other words, foreign investors stand to get a smaller payout in terms of their domestic currencies when they eventually sell their dollar investments. Here's a figure from the ever-useful FRED website run by the St. Louis Fed showing the overall sag of the U.S. dollar over time, with some notable bumps in the road along the way. 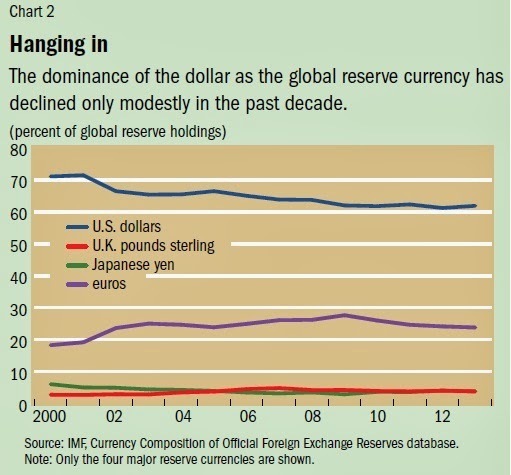 Over time, one would expect the role of the U.S. dollar to decline as the global reserve currency. Other economies are growing faster. More closely integrated global financial markets are making it easier to carry out transactions that don't involve the U.S. dollar. But the typical predictions, from Prasad and others, is that the dollar will remain dominant not just for a few more years, but perhaps for a few more decades. Part of the reason is that no clear alternative is available. Some well-informed folks continue to doubt whether the euro can survive. China's economy is headed for being the largest in the world, but as Prasad judiciously writes, "the limited financial market development and structure of political and legal institutions in China make it unlikely that the renminbi will become a major reserve asset hat foreign investors, including other central banks, turn to for safekeeping of their funds. At best, the renminbi will erode but not significantly challenge the dollar’s preeminent status. No other emerging market economies are in a position to have their currencies ascend to reserve status, let alone challenge the dollar." The Dollar Trap: How the U.S. Dollar Tightened Its Grip on Global Finance. I can also recommend Barry Eichengreen's book on the subject, Exorbitant Privilege: The Rise and Fall of the Dollar and the Future of the International Monetary System, which offers additional historical perspective. "Suppose a reasonably affluent Brazilian family was interested in visiting Disney World in Florida. First they must fill out the DS-160 online application. Then they must pay a $160 application fee per visa and perform two separate interviews, one of which requires invasive questions and fingerprinting. The interviews typically must take place at an American embassy or consulate, of which there are only four locations in all of Brazil–a country as big as the continental United States–meaning that many of the Brazilian applicants will have to travel for the interview. While visas may take only 10 days to process, delays are common, and the United States government recommends not making travel plans until receiving the visa. To make matters even more uncertain, consular officials can stop the process at any moment and deny the family a visa without reason. The Brazilian family could go through that entire lengthy, expensive, and uncertain process or they could go to Disneyland Paris, France, without getting a visa at all. Unsurprisingly, many Brazilian families choose to go to Disneyland in France over the United States." By their estimates, removing visa requirements completely could triple the number of international tourists in the United States. "Eliminating all travel visas to the United States could increase tourism by 45–67 million visitors annually, corresponding to an additional $90–123 billion in tourist spending." "The United States could phase in tourist visa reciprocity with nations that do not have a history of sending many unauthorized immigrants or that do not present security threats. Tourists from Malaysia, Botswana, Mongolia, Uruguay, and Georgia–nations that do not require Americans to obtain visas before visiting–could be allowed to enter without a visa to begin with, phasing in other nations depending on the success of those liberalizations. If the American authorities grow confident in their ability to limit visa overstays or the possibility of unauthorized immigration is greatly reduced, reciprocity could eventually be phased in with Mexico, Central American countries, and Caribbean nations as well." Americans need to stop thinking about international tourism as only something where Americans spend money abroad, and start thinking about it as an economic opportunity, too. In a globalizing world economy, the countries that make an effort to be at the crossroads of that economy will have particular advantages. As professional academics, we must extract the small nuggets of material relevant to our our interests from the mass of stuff that is being produced. Finding what we need to read necessarily means overlooking so much else. The more that is published in our discipline, the more there is to ignore. In consequence, the sheer volume of published material will be narrowing, not widening, horizons, containing us within ever smaller, less varied sub-worlds. It is important to remember that no one designed this system. There was not a moment in history when a group of powerful figures sat down in secret around a table and said: `Let us create a situation where academics have to read narrowly and to write at speed; that will stop them making trouble.' No secret meeting planned all this. But this is where we are now." The great difficulty with lifetime financial choices is that you only get to do them once. With lots of choices in a market, like buying dinner or buying clothes, the choices are made and the consequences are experienced in a fairly short time. Mistakes are fairly small-scale. If you don't like the clothes or the restaurant, go somewhere else next time. Indeed, one of the ways that competitive market forces work to encourage value and quality is through this process of repeated (or not!) purchases. But in a single lifetime, you get to try out precisely one set of lifetime financial choices. If at age 50 or 60 or 70 or 80 you wish that you had done something different earlier in life, you can't go back to your 20s and 30s and 40s and live it over again. Remember, these questions are multiple choice, and you don't need to really understand the subject in any depth to make a plausible guess at the correct answers. These three questions were included as part of the Health and Retirement Survey in 2004, which is a nationally representative sample of Americans age 50 and over. Apparently, about one-third of Americans are able to answer all three of these questions correctly. U.S. Financial Capability Study, 70 percent of respondents gave themselves score of 4 or higher (out of 7), but only 30 percent of the sample could answer the factual questions correctly ..."
Of course, a lack of financial literacy has many costs. People don't save enough, so that they become more vulnerable if their car breaks down, or someone in the family gets sick, or loses a job. They are also vulnerable to costly financial decisions. Instead of having a bank account, they end up paying high fees through pawn shops and payday loans. They often pay high credit card fees. They end up in costly arrangements when buying cars or appliances or houses, and when interest rates fall (as in the last few years), they fail to refinance their mortgage or other loans. They end up poor in retirement. Regulators have in the past tended to respond to these issues by requiring more and more disclosure, but adding more fine print is not the superhighway to financial literacy. The harder challenge is to specify a smaller number of clear choices, with sensible default options that will work for most of those who choose note to make a choice. People have different needs and desires, so this isn't easy. On the other hand, people who function in 21st century America need to deal with health care choices, consumer electronics, software, map-reading, insurance, and lot of other issues. Most of them can manage the basics of financial literacy, too. But they need to learn it relatively young, because knowing when you're 60 what you should have done when you were 25 is not useful. expensive, for which kinds of people." The issue of income inequality is international. The IMF Fiscal Affairs Department provides an overview in an IMF Policy Paper "Fiscal Policy and Income Inequality," published January 23, 2014. 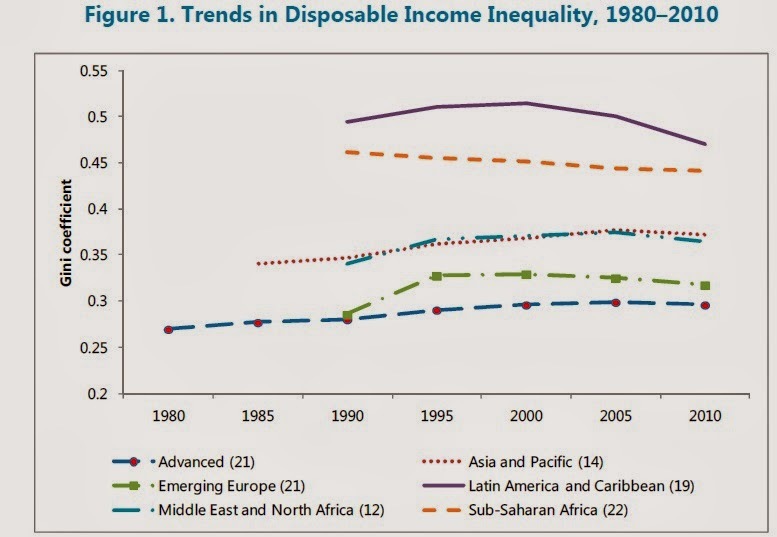 As a starting point, consider inequality across the world by region, as shown in Figure 1. The measure of inequality here is the Gini coefficient, a measure of inequality which ranges from zero where everyone has the same income to 1 when one person has all the income. The measure of income here is "disposable income," which means that it is income after taxes and after transfers of income, but it does not include "in-kind" transfers like the provision of food stamps or Medicaid in the United States. The number in parentheses shows the number of countries in each group. (sub-Saharan Africa and Latin America) remained 12 percentage points higher than the two most equal regions (emerging Europe and advanced economies)." 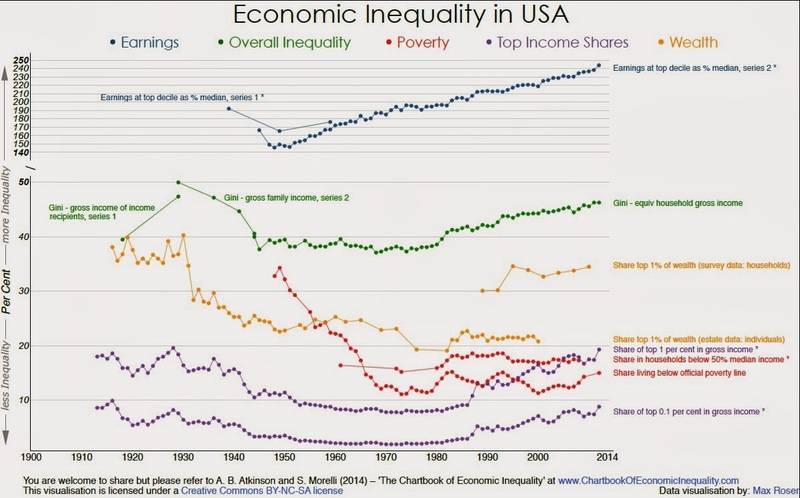 The long-term patterns of inequality at the very top of the income distribution vary as well. 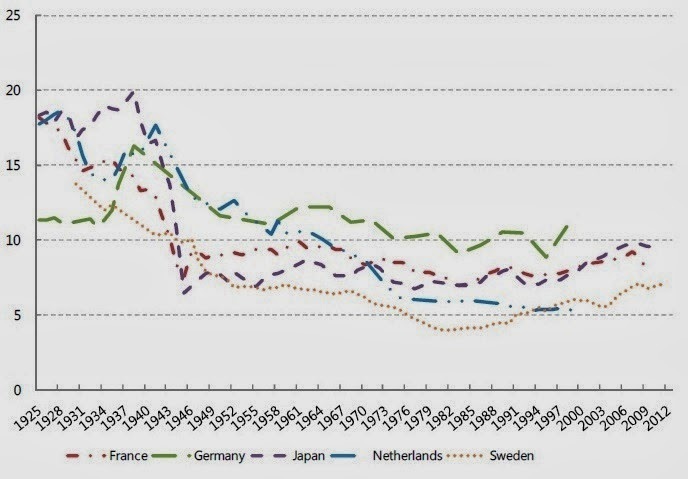 For one group of countries--including the US, Canada, the UK, China, and India--the share of gross income going to the top 1% fell through much of the 1950s and 1960s, but has now risen back to levels similar to the 1920s and 1930s. However, in another group of countries--France, Germany, Japan, Sweden--the share of gross income going to the top 1% declined, but then has pretty much flattened out. 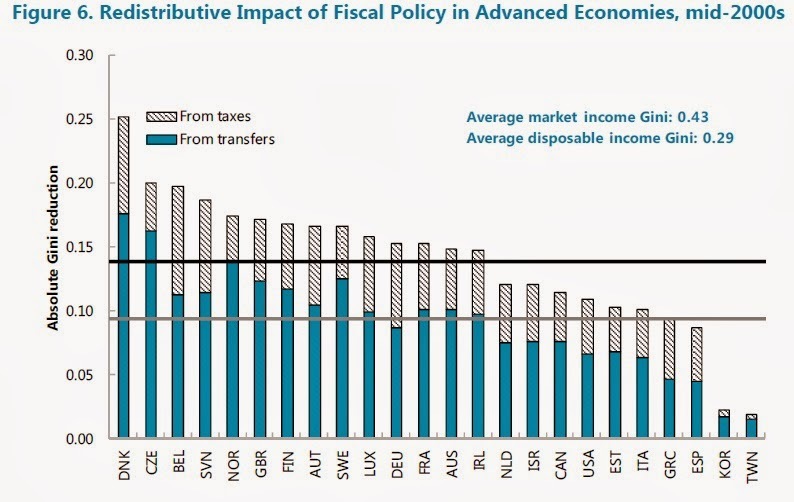 As the IMF report points out, "a large proportion of the differences in regional average disposable income inequalities can be explained by differences in fiscal policies, especially in the levels and composition of taxes and spending." As a starting point, here's a figure based on public opinion polls showing public support for redistribution. The horizontal axis shows support for redistribution in the late 1990s and the vertical axis shows support in the late 2000s. If a country is right on the black line, that means that polling data showed the same support for redistribution in the late 2000s as in the late 1990s. The USA, for example, is quite close to the black line. 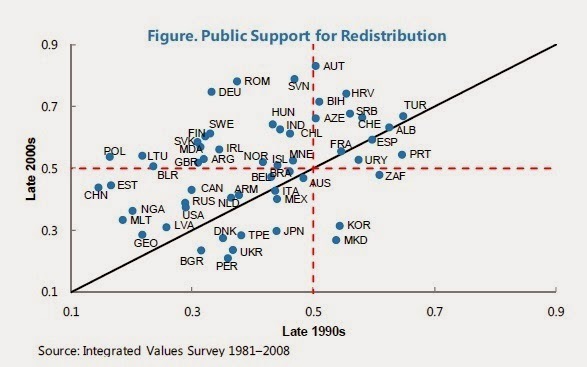 But most countries are above the line, showing that public support for redistribution increased. "These surveys, which include the World Value Surveys (WVS), Regional Barometers, and International Social Surveys, ask citizens whether they favor more or less redistribution. In the WVS, respondents are asked to indicate, on a scale from 1 to 10, whether “incomes should be made more equal” (1) or whether the country “needs larger income differences as incentive” (10). For our purposes, we divide these responses in two categories: answers 1 to 5 indicate that the respondents prefer more redistribution, and answers 6 to 10 indicate preference for less redistribution. A similar approach is applied to other surveys to find the share of the population that supports more redistribution. The evidence indicates that public support for redistributive policies has grown in recent decades. Between the late-1990s and the late-2000s, public support for redistribution increased in almost 70 percent of the advanced and developing economies surveyed. For instance, support increased substantially in Finland, Germany, and Sweden, and also in China and India ... Support for redistribution grew more in countries where inequality increased and, more recently, in advanced economies where the crisis hit hardest. For instance, public support between the late-1990s and the late-2000s grew by more than 30 percentage points in China, Finland, Germany and several Eastern European countries, where the income Gini increased by over 20 percent. At the same time, support declined in countries where the Gini decreased, including in Bulgaria, Mexico, Peru, and Ukraine." The IMF calculates how much redistribution is actually happening through tax and spending policies: that is, how much is the Gini coefficient reduced by the tax and transfer policies enacted by government. Here's a measure for the advanced economies, where the Gini based on market incomes would average .43, but the Gini based on disposable after-tax after-transfer income is .29. 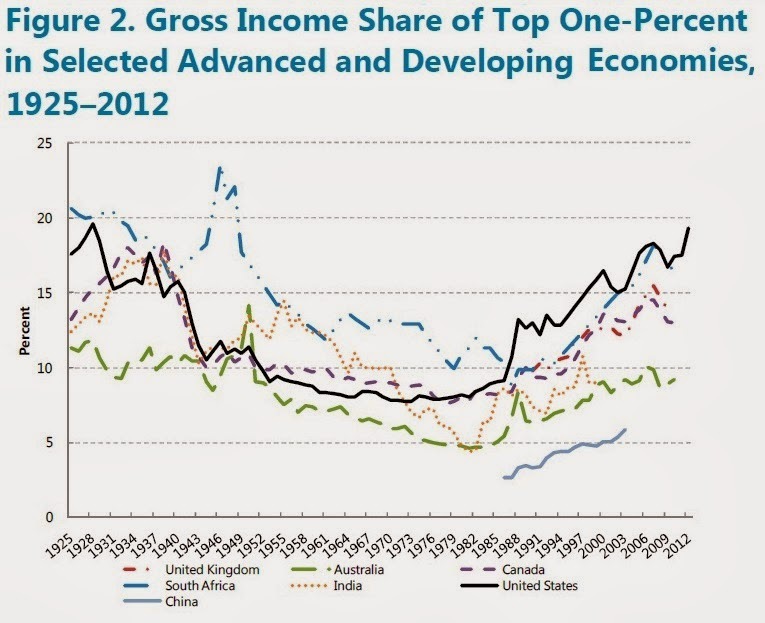 As the figure shows, the U.S. does less redistribution than other high-income countries. But the figure also helps to illustrate a perhaps less-known point: the lower level of U.S. redistribution is more on the spending side than on the tax side. Many European countries collect a lot of their tax revenues through value-added taxes or energy taxes, which work like sales taxes in collecting a higher share of income from those who have lower incomes, and who consume a higher share of their income. 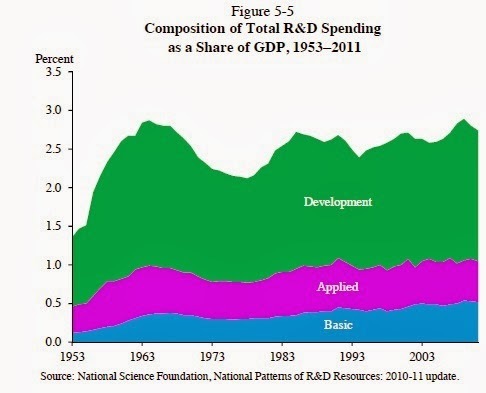 Indeed, the amount of redistribution that the U.S. does through taxes hasn't changed much in the last couple of decades, but the amount of redistribution that it does through transfer spending programs has declined substantially, in part because the big entitlement spending programs like Social Security and Medicare are not especially aimed at the poor. The report has much more to say about the design of tax and transfer programs around the world. To be sure, the U.S. teen birthrate remains well above that of most other high-income countries, where, as Kearney and Levine point out, the teen birthrate is usually in the range of 5-10 births per 1,000 women aged 15-19. 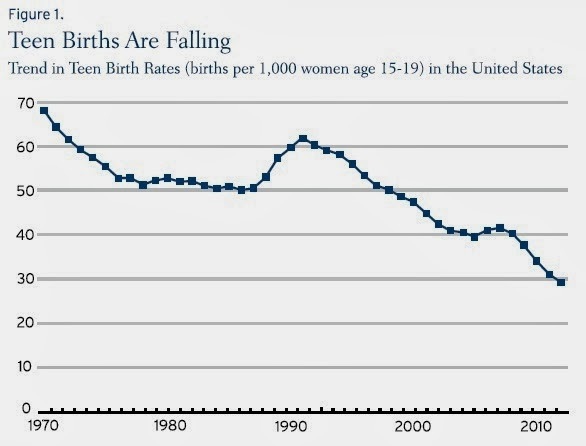 Still, the teen birth rate in the U.S. has fallen by half in the last couple of decades. What might be the underlying causes? ultimately considers that individuals – even teens – respond to the environment around them and make choices that either increase or decrease the likelihood of becoming a teen parent. Indeed, the data suggest as much, with teen childbearing rates rising and falling with environmental factors in systematic ways." policies to have had a discernible effect. However, their effect is limited: we calculate that these two policies together account for only 12 percent of the reduction in teen childbearing between 1991 and 2008. Our analysis yields no evidence suggesting that other policies had a significant role in the decline." Thus, if state-level differences are not the main factor, the next place to look is in broader economic or social patterns across states. In addition, these need to be factors that apply through both good and bad economic times over the last couple of decades. Indeed, although the U.S. has the highest rate of teen births across high-income countries, the rate of teen births has been falling in most countries, which suggests that at least some of the causes are broader than U.S. policies or socioeconomic conditions. "We speculate that there are two likely candidate explanations: (1) access to improved contraceptive technologies, most notably long-acting reversible contraception (LARCs) such as implants and intrauterine devices (IUDs) and (2) increased educational attainment along with better labor market prospects for young women. ... The policy challenge that we believe offers the greatest potential is to address the needs of those young women who are not committed to avoiding a pregnancy. These are teens whose views are characterized by ambivalence. For them, the issue is more about finding ways to make them want to avoid a teen birth. ... Simply put, increased aspirations and expanded opportunities for young women have the potential to extend the downward trend in teen childbearing." Selling a Kidney: Would the Option Necessarily be Beneficial? The March 2014 issue of the Journal of Medical Ethics has a symposium on the issues of whether people should be allowed to sell a kidney. The lead article by Simon Rippon, "Imposing options on people in poverty: the harm of a live donor organ market," is freely available on-line, but you need a subscription to read the comments. organs. It is certainly difficult to imagine any plausible explanation of the wrongness of selling organs that would not equally count against giving them away. It is true that these two types of act differ in that giving organs away is presumably motivated altruistically, whereas selling need not be—but it is not usually considered intrinsically wrong to act from non-altruistic motives. Even if giving organs away is morally better than selling them, it is implausible to suggest that we therefore ought to encourage donation by banning selling entirely, when the cost of doing so might be measured in the loss of thousands of innocent lives due to an inadequate supply of organs. For this reason I will set aside this objection to organ markets, and turn to another. My objection will not depend on the claim that there is anything intrinsically morally wrong with selling or buying organs." prominent sign displaying that information) than for the cashier to have the key which gives him the option to open it. Possession of the key would make the cashier vulnerable to threats, and the filling station worth robbing." We should ask questions such as the following: Would those in poverty be eligible for bankruptcy protection, or for public assistance, if they have an organ that they choose not to sell? Could they be legally forced to sell an organ to pay taxes, paternity bills or rent? How would society view someone who asks for charitable assistance to meet her basic needs, if she could easily sell a healthy ‘excess’ organ to meet them? ... Wherever there is great value in not being put under social or legal pressure to sell something as a result of economic forces, we should think carefully about whether it is right to permit a market and to thereby impose the option on everyone to sell it." The idea that certain activities should be banned not because they are necessarily wrong, but because otherwise there would be social pressure to participate, has some intuitive plausibility, but in practice, it leads to some of our trickiest social issues. For example, some European countries have at times banned headscarves, thus meaning that Islamic women are not under social pressure to wear them. There are arguments for banning circumcision, to protect families from social pressure to have the procedure done. That said, the concern that powerless people might be pressured into selling a kidney seems to me a legitimate concern and counterargument. The commenters on Rippon's essay raise a number of possible responses. he must establish that there is a class of harms that (1) are likely to occur, (2) are significant enough to outweigh the enormous benefit of saving people’s lives, and (3) cannot be mitigated sufficiently by intelligent regulation ..."
Dworkin points out that if Rippon's concerns were likely to occur, we have already entered that world. "But we already have formal markets in blood, tissues, sperm and eggs. And lest one think that the sums offered in these markets are trivial, it is not uncommon for infertile couples to make offers of US$50 000 for eggs that meet their specifications. Is there any evidence of the kinds of speculative harms adduced by Rippon—ineligibility for bankruptcy protection or for public assistance—in these markets?" sooner rather than later. I think the ability to determine the timing of your death is sufficiently important to expose those who do not wish to die sooner to pressures they will have to resist. Similarly, I believe that greater access to organs necessary to continued life for many people justifies imposing risks of social pressures which, at the moment, we have little evidence will occur (or not) and have even less evidence are not preventable by regulation." My sketch here cannot do justice to all of the arguments involved, but I will add two points. First, at present, the main source of kidney donations is people who die unexpectedly, with a few voluntary donors. In the meantime, thousands of Americans die every year awaiting a kidney transplant. I can easily imagine that a substantial group of healthy people might not be willing to donate a kidney for free, but would be willing to do so for substantial compensation, and encouraging transplants from healthy donors could save thousands of lives. Second, it troubles me that we often expect the donors of kidneys and blood to act out of sheer altruism, but we have no such expectation of any of the other participants in an organ transplant, like the health care providers or the hospital. For those interested in how economists view this issue, the Journal of Economic Perspectives had a Symposium on Organ Transplants in the Summer 2007 issue with two Nobel laureates among the authors. (Full disclosure, I've been the Managing Editor of JEP since 1987.) All articles in JEP are freely available, courtesy of the American Economic Association. The recovery of the U.S. economy since the end of the Great Recession in June 2009 has been sluggish and weak--and still much better than in most high-income countries. Here a figure from the 2014 Economic Report of the President, released earlier this week. The figure shows Real GDP per Working Age Population. Real GDP means that it is measuring national economic output adjusted for inflation. By looking at "working age population," it is adjusting for size of population but not (in a direct way) for level of unemployment. The horizontal axis measures quarters that have passed since the start of the recession. The vertical axis set the measure of output for each country equal to 100 at that time, so that you can easily compare the patterns across countries since that time. A few lessons jump out at me. 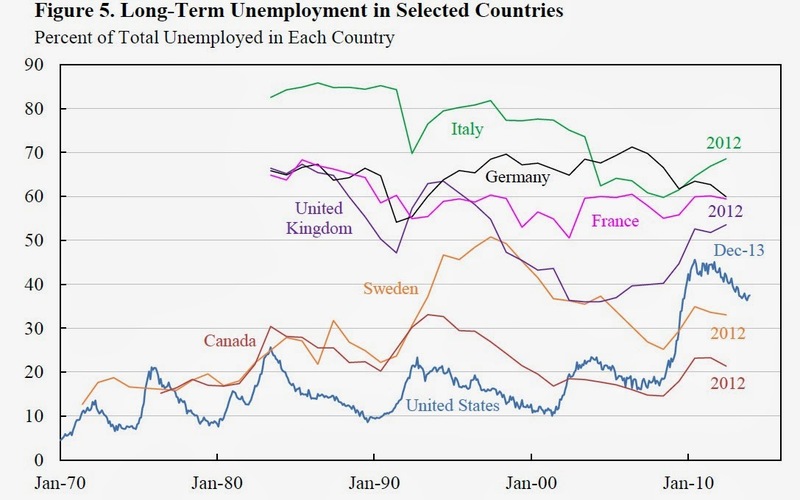 1) The U.S. and Germany are the only two of the 12 countries shown that have recovered back to the level of output/working-age population from before the Great Recession. 2) It's natural for Americans to focus on the problems of the U.S. economy, but by comparison, the U.S. economy is looking pretty good. The euro crisis isn't in the headlines right now, and I sometimes read that the crisis is past us. 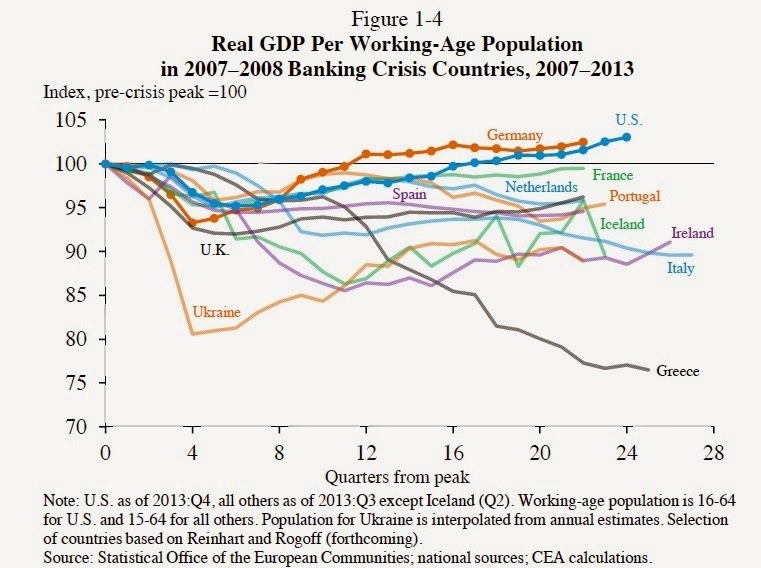 But look at the output/population level in Greece or in Italy, still sinking. The euro-area unemployment rate is up around 12%, and is at 25% in Spain and Greece. Germany, thanks to flexibility of its labor market institutions and benefits from the euro zone, has been doing well, too. 3) Ukraine was added to this graph at what I suspect was the last minute. You can see the shock that hit Ukraine's economy back in 2008, and how slow it has been to recover. 4) International comparisons are always a bit tricky. 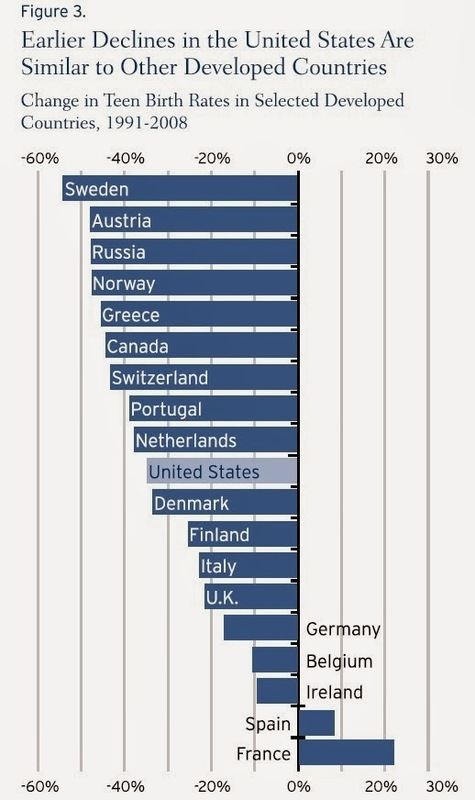 After all, the U.S. has been less affected by the euro crisis than countries of the European Union. Nonetheless, the basic fact is that the U.S. economy is leading the way in this comparison group, which suggests that U.S. economic policy in the aftermath of the Great Recession did something right. To put it another way, critics of the U.S. fiscal and monetary policies in the aftermath of the Great Recession need to explain why, if the policies were so bad, the outcome has been comparatively so good. The basic student experience in many schools is quite similar to what it was a half-century ago. Te school day is divided into periods, each period is a subject, each subject has a teacher, and it all happens in a building that has been there for decades. Nowadays there's some additional technology mixed in. But perhaps, for at least some schools, a bigger shake-up is called for? Caroline Hoxby offers some thoughts in "The Global Achievement Gap," published in the journal Defining Ideas from the Hoover Institution. In my own reading, her essay suggests to me three potentially useful ways of shaking up public schools. 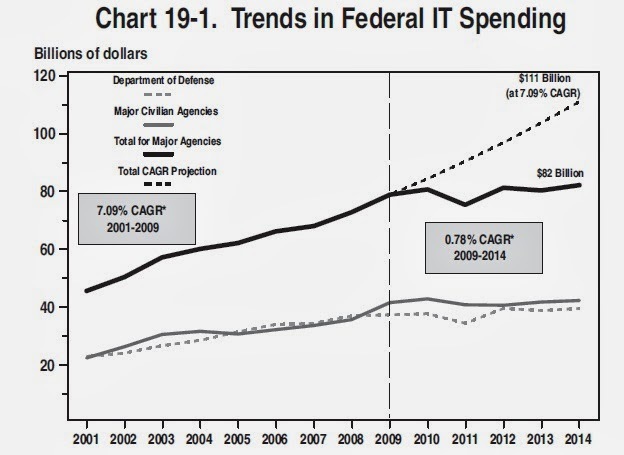 1) More extensive use of information technology. The Rocketship schools have current per-pupil expenditures equal to 79 percent of that of traditional public schools in their county: $7,492 for Rocketship and $9,463 for the other schools. How do they manage this? First, their ratio of pupils to classroom teachers is 30.5 while the traditional public schools' is 21.6. Thus, Rocketship schools need only two teachers for every three teachers whom the traditional public schools need. According to their accounts, this entire reduction is attained by means of computers being used for mundane instruction and practice of skills. Second, Rocketship schools spend a much lower share of their budget on the wages and salaries of non-teachers: 12.7 percent as opposed to 32.6 percent. This is largely because they have approximately one non-teaching staff member for every three such people at traditional public schools. The schools’ explanation is that they have less need for administrators and support staff because technology performs many of the tracking and paperwork tasks that such people perform in traditional public schools. 2) Find "master teachers," pay them accordingly, and restructure the rest of the teaching staff. "One might wonder how it is possible that US public schools could, within their current budgets, pay teachers in a manner that is so competitive with private sector rewards. The main explanation is that although high value-added teachers are currently underpaid, low value-added teachers who have high seniority, master's degrees, and other paper credentials are systemically overpaid relative to their alternative jobs. They have no incentive to leave teaching, therefore. They also have no incentive to improve their value-added. Low value-added teachers absorb so much of the total compensation budget that little is left for high value-added starting teachers, who are not only underpaid if they do teach but who tend to leave teaching as a result." 3) Expand the school day and the school year. 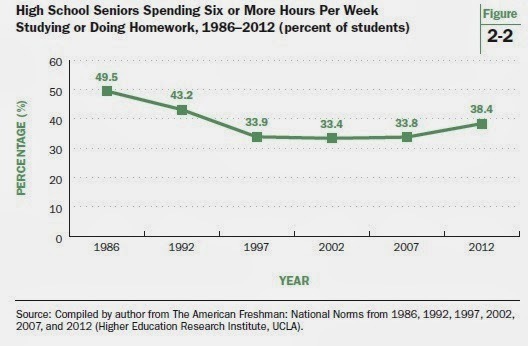 "Traditional public schools spend considerable effort ensuring that the number of hours that a teacher is in the classroom is below some amount, that her hours for preparation are above some amount, that the days in the school year are below some amount, and that professional development days are above some amount. In contrast, many choice schools recognize that students’ achievement can be directly affected by the hours and days they spend on school grounds, in the school’s custodial care (not necessarily in instruction), and on fundamental tasks like reading. 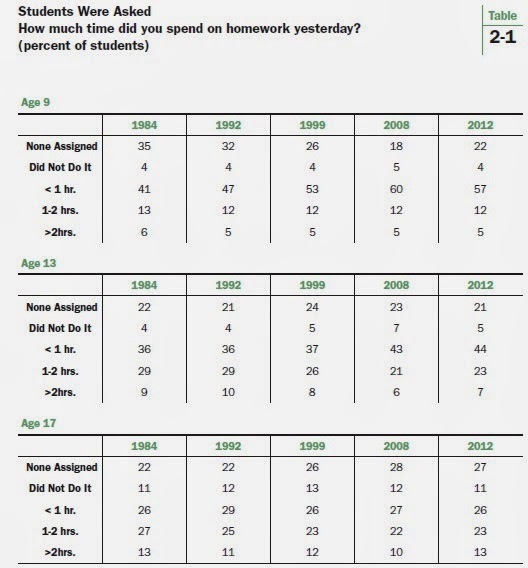 Thus, it is not unusual to see choice schools experiment with year-round calendars; school days that start early and end late; and school days that contain substantial periods for meals, homework, and play. Choice schools often make these changes pay for themselves by substituting non-teachers for teachers efficiently (when instruction is not going on), by reducing losses associated with students taking books and materials home, and by reducing the need for remediation and disabled instruction." Hoxby is a big believer in school choice and charter schools as ways to drive a process of experimentation and evolution in how K-12 education is delivered. My point here is not to argue the case for how such change should be implemented, but to point out that most K-12 schools basically operate in a mid-20th century structure, with some computers sprinkled on top. Education is so very important for social and economic equality within the United States and for economic growth in the context of a globalizing economy. For so many students, U.S. schools badly need shaking up.